A London with Victorian architecture, heritage streetscapes, a revitalized downtown, and trees. 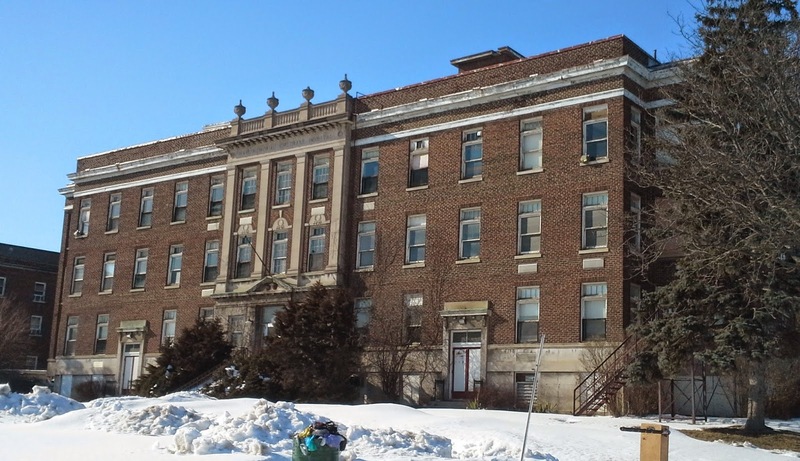 At a City Hall Planning and Environment Committee meeting on Monday, March 8th, City Planner John Fleming recommended saving two of the former Victoria Hospital buildings on South Street, the Colborne building and the original part of the War Memorial Children’s Hospital, built 1922. There are other older buildings on the site, namely the Medical Services Building, Gartshore Nurses’ Residence, and a row of 1950s buildings on Hill Street. Time constraints usually prevent me from attending city planning meetings but I made it to this one. There was an awesome moment when Ward 4 Councillor Jesse Helmer made a motion to save all four buildings on South Street – awesome because it isn’t often we hear a city politician make an impassioned plea to save a heritage streetscape. Unfortunately, his motion didn’t get a seconder. 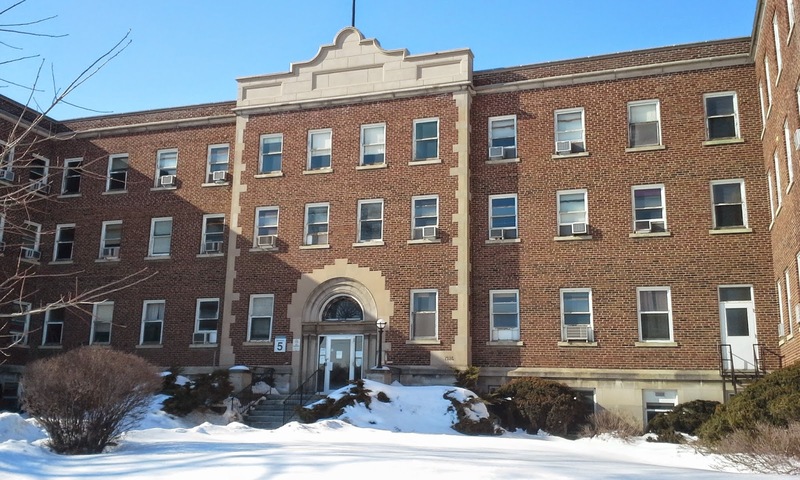 In the end, the committee voted to keep the Medical Services Building, the original 1922 section of the War Memorial building, and the Colborne building across the street. Imagine, London councillors actually voting to save more than what was recommended. For the most part I’m pleased. Tearing down the War Memorial Children’s Hospital would have been a poor way to commemorate the 100th anniversary of the First World War. The oldest section was built in 1922 with funds raised by the IODE. The top is graced with four urns, symbols of mourning, with three carved wreaths below. 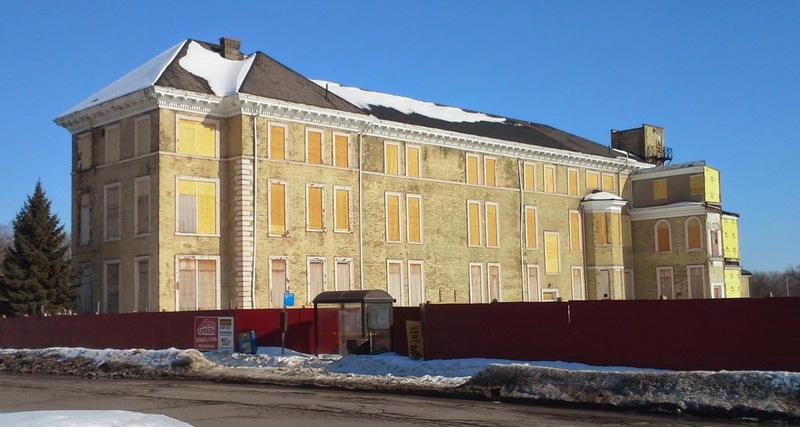 The boarded-up Colborne building across the street, built 1899, is now the oldest remaining hospital building on the site. There are large costs involved in saving these buildings, including security, abatement (the removal of hazardous materials), and carrying costs of about $1 million a year until the buildings are sold. Abatement shouldn’t be an important issue, though, because hazardous materials have to be removed whether the buildings are saved or demolished. But then, if the city is going to spend the money to save three buildings, why not spend a bit more and save all four? The problem is that the nurses’ residence was built as a dormitory and therefore had very small rooms. It simply didn’t lend itself to much in the way of adaptive reuse. It would have been nice to have at least saved its façade, though. I’m not generally in favour of what’s been called facadism, but saving the façade might look less peculiar than plunking an entire modern building onto an early twentieth-century street. As for the mid-century modern buildings on Hill Street, I’ll stick with my unpopular opinion that mid-twentieth century is when architecture ended and unsightliness began. No doubt Growing Concern Day Care centre, currently housed in the former Crippled Children’s Treatment Centre, would like to stay where it is, but the building is about to become a victim of progress. One hopes the replacement buildings will look better, not worse. Speaking of those new buildings, we have no idea what they’ll be. Imagine a city tearing down almost an entire complex of buildings without having the faintest idea what they’re going to replace them with. Will the space be filled with condos? Offices? A commercial centre for a newly-revitalized SoHo? Perhaps the site of the old Victoria Hospital is where we’ll build our performing arts centre? Update, September 2015: Next month the City of London intends to send out a request to developers for proposals. I hope whatever is built on this site will fit in with the neighbourhood's heritage and history. But developers, of course, will build whatever they think will earn them the most money and that's rarely sympathetic infill. Update, September 2017: The Colborne Building has been given a heritage designation by Planning & Environment Committee. Update, April 2018: At last the city has begun the design process to redevelop the old Victoria Hospital lands. A contract has been awarded by council to Dillon Consulting, to be completed over the next two years. Construction could start as early as 2020 on two apartment towers and other projects. Let's hope the remaining buildings can be incorporated into the overall design. It is too late for Toronto as the city has virtually lost whole eras of architecture so it would be sad to see the same happen to London. I know the city well enough not to get lost when I visit and have friends in Wortley Village. Fortunately there hasn't be a huge influx pf development money flowing into London over the years and that has meant not as much demolition.So it's encouraging to see the council's decision to save these buildings. Save them for what purpose? Do you save your old out of style and worn out clothes to remind you of the times when you bought and wore them? I doubt it. London City council and the "dynastic" employees in City Management need a kick in the pants to get them focused on the real issues facing living Londoners today - that being the lack of decent paying jobs, the homeless and mentally challenged (they walk the streets daily) senior's and veteran's support and proper health care for all! These are the real issues facing Londoner's today and going into the future. What about access to basic necessities for people in the downtown core - like safe and well light streets, medical and dental care, grocery stores, dry cleaners etc. What is really needed in London is an efficiency review of ALL City Managers and their respective departments. What have they really done lately? Heritage Property Rules need to be reviewed and revamped so they are in concert with progress and developers need to be on the committee. Yes, our history and heritage is important, but, not at the cost of progress! If you want to preserve our heritage, spend your time and money to write a book about it and see who buys it. Hint: You won't even get it published. You are in the smallest of minorities. No one cares about these petty issues but you. President of ACO London. Heritage advocate. Core resident.